AFL Goal Posts – Ultimate One End goal Post set. These Backyard Footy Posts kits are quite bulky to transport and Australia is a big country, so there are costs involved in shipping them to you within Australia. These costs have been included in the price. New to our range to get the little Auskick kids hooked early! The Goal posts are 1.5m high and the Behind posts are 75cm high. Suits kids up to around 4 years young. 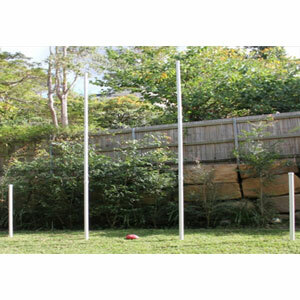 The regular Backyard AFL goal post consist of 2 x 1.5m high point posts and 2 x 3m high goal posts. Perfect for turning your Auskick backyard into the “G”! Suits kids from 4 to 6 years young. high goal posts. For the serious little Backyard Footy Auskick players! Suits kids from 6 to 8 years young. NEW! This item has been custom requested from Natalie in Victoria and has become a part of our AFL range. It consists of 3 meter point posts and 4.5 meter goal posts. The ultimate AFL posts! Thanks Natalie for your suggestion! Suits kids from 8 years old or those who can get a good high kick on the ball. 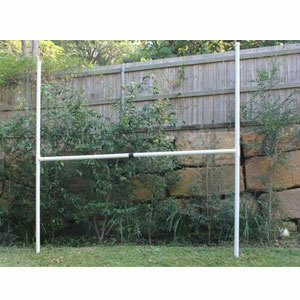 The Backyard Regular Footy Rugby Post will turn your backyard into your favourite footy stadium! Watch the kids relive their favourite field goal moments! This configuration has a 3m wide crossbar fixed at 1.5m high and 3m high posts. Suits kids up to around 8 years young. The Backyard Tall Footy Rugby Post is perfect for the aspiring little backyard footy legend. This configuration has a 3m wide crossbar fixed at 1.5m high and 4.5m high posts. The crossbar can also be fixed at 3m high, which is the standard competition height. Suits kids from 8 years old or those who can get a good high kick on the ball.